So I wanted to discuss the links between the shadow man from Shadows of Evil and ancient mythology and specifically the paranormal accounts of the hat man. I am not a believer in the paranormal but there are a lot of links here to the character of the shadow man and where the idea for this character may have originated. 'The hat man' is believed to be an entity from another realm. Perhaps a time traveller or an interdimensional being. In many accounts he is a black silhouette, stands between 6 and 7 feet tall and wears a trench coat with a high collar or cloak. He also has a 30’s-40’s style hat that many refer to as a fedora or a hat with a very prominent brim. He exists in the Shadows or on the periphery of a persons vision, and usually disappears very quickly upon being noticed. However, unlike reports of other shadow people does not fade away, but turns and walks away slowly. He is generally associated with and appears to people suffering negative emotions and his appearances are linked with death. There are also strong links with him appearing to people who are fraudsters or deceitful. ‘The Hat Man' appears in many different cultures all over the world and dates back thousands of years originating from creatures portrayed in ancient Arabic and Islamic mythology and theology. These were referred to as djinn or jinn a term which means ‘ hidden from sight' and were also seen as interdimensional beings from an alternate dimension within our own and although there appearance is different, one of their forms was that of the shadow. Could this ancient mythology and these paranormal experiences be the inspiration for the shadow man in Shadows of Evil? An interdimensional time traveller who appears to those that have sinned? Very interesting. I had never heard of the Shadow people being called "The Hat Man." Any sources other than that book that call him "The Hat Man?" 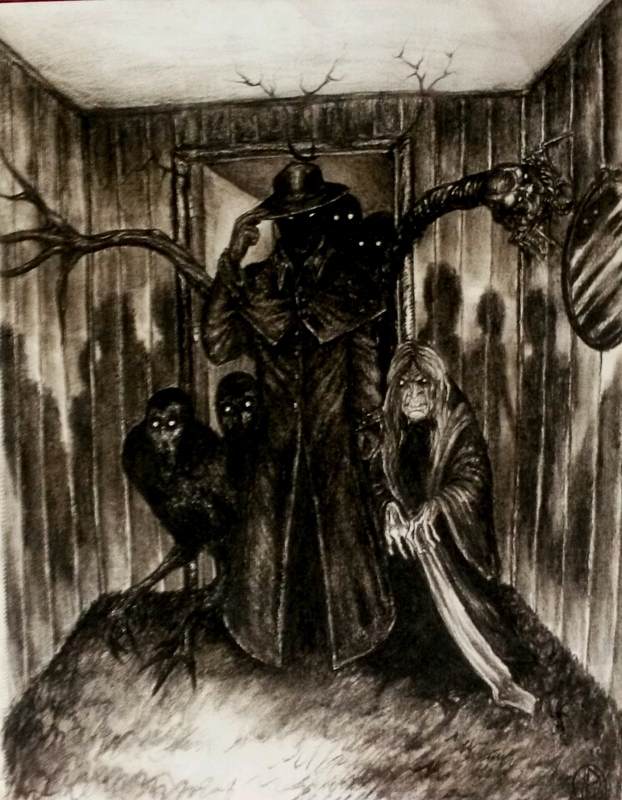 It appears stories/legends of 'the hat man' have been around for a long time in one way or another but the name was popularised when the author of the book, Heidi Hollis, appeared on a radio show referencing the shadow creature by that name. Nyarlathotep has already look like this.